I have noticed a change in games in the last 20 years. Many older games might use one six-sided die to generate a random number between one and six. Newer games more often have players role 6 dice, and have the players count each die that comes up 4-6. By mutliplying the number of random events by 6, there is an averaging effect, and the odds of extreme results are lower. It's an effective, interesting way of mitiagting the "Luck" factor in games. AHH the much maligned Luck! (Luck is a Lady - so it deserves to be capitalized). I have seen several geeklists on games with "No Luck" or "No Random Elements"; But then people go on debate about "How do you choose a starting position?" or "Who Goes First? ", and debate on about how much that little bit of randomness effects the outcome of the game. And while we are at it, would someone stop that butterfly in Asia from flapping it's wings? it seems the weekends around here have been a lot rainier than the weekdays lately and I am getting sick of it! Just about every game involves SOME random element. Traditionally, even the starting position in a game of chess is determined by one player picking a black or white pawn at random, held in his opponents hands. Professional players get around this by playing many matches, rotating starting position. Must of us do not have the luxury of playing many games, and need to look at game mechanisms that have ways of mitigating random effects. That is what this list is about, games allow you to overcome those bad rolls with game play. I really enjoy a game that involves dice, cards or chits, but where I don't feel I lost the game due to "bad Luck". I will start this list with 5 games that use (from my point of view at least) different major mechanisms to mitigate thier random elements. As people add games to the list, please point out what you perceive as the factor that mitigates random elements, and how well you think it works. 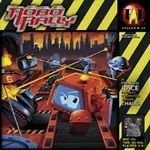 This is the game that made me think of this list. Chits are distributed at random to players, and yet I feel as though that random element has surprisingly little effect on the ability of a player to win the game. Players are allowed to purchase any stock they wish, and profit from other people's moves. A savy player can look at who is buying what stock, and get an idea of what plays opponents are trying to make happen. 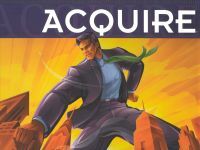 That is not to say that being able to merge or prevent a merger does not give a player a great advantage, but an astute player can still buy the appropriate stock until it runs out. I think it is a great game mechanic to allow you to invest in anything on the board. I never complain about "poor Luck" when playing this game, even when I do have poor luck - because I always always say "I should have bought more shares of X!". Mitigation Mechanism: Major game mechanism (the buying of stock) is open to all players (almost) equally and is not affected by random elements. There is a Reoccurring theme in several James Earnest games "Experience is what you get when you Don't get what you want". 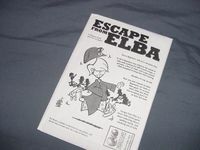 To my mind Escape from Elba demonstrates this concept best. OH - you have a bad turn with poor die rolls and cannot advance: don't worry!, next turn your die roll will have a better modifier than your opponent who had a GOOD die roll this turn! When you lose in a turn, it's still all good in this game! you know that next turn, what did not kill you only made you stronger. Another mechanic that I really appreciate. 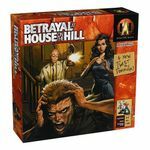 I debate putting this on the list, but there is a mechanic here that is different from the other games: the use of board elements to improve play. It is possible with this game to get from one square to another using a several very different sets of cards. I will complain about bad cards in this game, but usually instead of complaining I find myself trying to make the most out of what I have - and sometimes a set of cards that seemed awtful will turn out to be surprisingly useful on further inspection. The fact that cards are redealt often takes a little of the sting out of a bad hand. Mitigaion Mechanism: Board Elements can be used in conjuction with random elements (cards) to obtain the game goal. The dice in game are six sided, but have blanks, ones and twos on the faces. 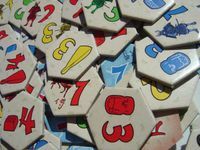 In the game players end up rolling hadfuls of the dice (often more than 4)and add up the numbers. This is an example of the mechanism I gave at the start of the list, increasing the number of random events (dice) but having the value of each event be lower. There are several games that do this - this is the one that came to my mind while thinking of the list because I played it recently. 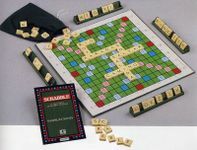 The classic game with a lot of random elements (tiles) that can be used in almost any fashion. Gameplay is limited only by a players knowledge and imagination. As I look at my seven tiles and look at the board I can't help but think "There is a word in here somewhere if only I would find it!" It's hard to complain about Luck when there are HUNDREDS OF TOUSHANDS of game options listed in the OED! surely at least ONE of them can be used in my situation! Mitigation Mechanism: Practically unlimited gameplay options. Princes of Florence does a wonderful job of offering variety and options to a player by allowing you to draw 5 cards from the deck whenever you draw Prestige, Bonus or Profession cards, and selecting the one you want. Can you imagine how ridiculously imbalanced and luck-laden the game would be if you drew only one card and were stuck with it? Player A could get a coup by drawing exactly what they need, while Player B wastes money/actions getting something that's virtually useless. In Samurai, every one has the same number and type of tiles to place onto the board. But the order the tiles come into your hand and thus into play determines what you can do when. In Blood Bowl, luck is mitigated in a number of ways. Chief among them is the concept of Rerolls. Some players have skills that allow them to reroll a bad result on certain actions. Teams can also purchase a number of general Rerolls that they can use for any action they fail on their own turns. There's also skills that change the results of a block, which are determined by the roll of the special block dice. 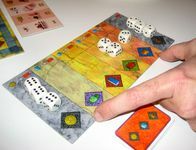 Settlers is about the statistical distribution of the rolling of a pair of dice. Unfortunately, the game tends to be too short for the distribution to settle, and a collection of "bad" rolls at the beginning of the game can easily sideline players. Enter the event cards. They exactly match the correct distribution of a pair of dice. To retain a little random, you don't draw the entire deck before reshuffling, you stop five cards before the end. I find Settlers to be far more fun and challenging with the event cards, rather than being pot luck. Yspahan springs to mind immediately for me. This got played at game night yesterday, and I heard my buddy say, "This is a really great mechanic," referring to the dice distribution on the tower. Sure, we saw three or four times where only three slots were filled--hardly good for a 4-player game--but more often than not the dice were distributed well on the board, and the city map itself was filled just as intended (i.e., with Vase town filling infrequently, but offering the most points). Plenty of luck, for sure, but the strategy and mechanics of the game, I have found, definitely mitigate this. This is the game that definently gets rid of a lot of the luck. Well since the rooms are randomly placed and the treasures and such revealed in a room are kind of placed according to the room, that's where the only part of the luck comes in. Pretty fun game, but trust me guys....bring a timer. I use the 3 minute boggle timer myself. Eliminates a lot of downtime, which there could be a lot. But since it's like chess....some people like downtime...just not me!